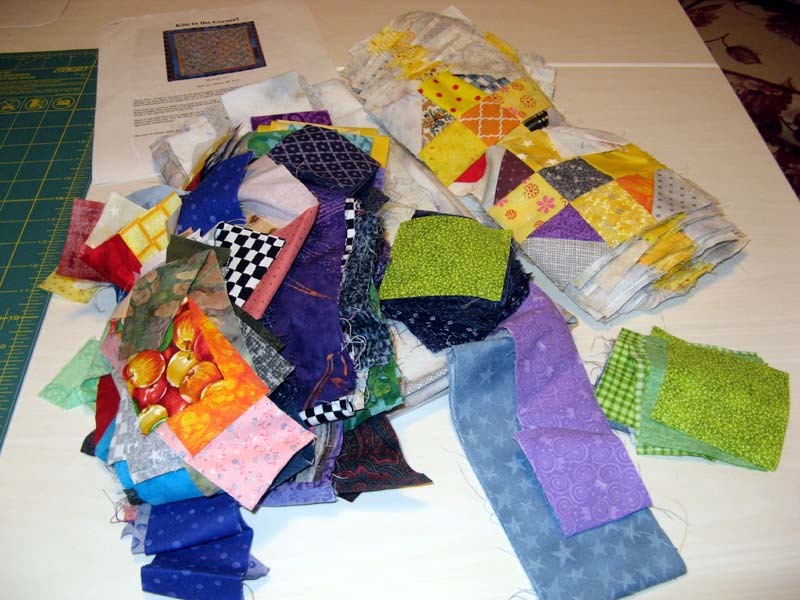 This year I'll be participating in Patchwork Times 2017 UFO Challenge. These projects will be my challenge for 2017! #1 Kourtepointe. En Provence, Bonnie Hunter's 2016 Winter Mystery, Quiltville.com. Introduced the first week of November with the first part release on Black Friday. Courtepointe is a French word meaning bed cover or bedspread; their interpretation of the English word for quilt. This one is in full production mode with the last part being released right around New Years Day. #2 Kanton Kull. 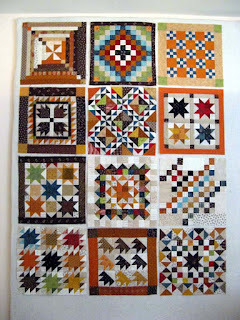 A Prairie Gathering, Pam Buda, Heartspun Quilts. This was a BOM project from the now closed Country Loft. Display was hung in the store during a quick visit in June 2015. Kerry and I caught up on the distribution of the monthly kits that were fortunately still available. Kerry and I started then languished in 2016 trying to get this one done as a BOM project. The start for this one is at Chapter 4. #3 Kastaway. 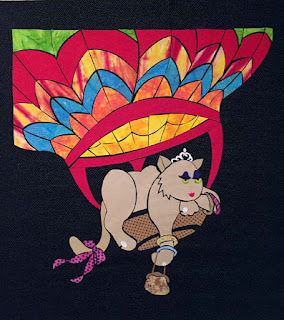 Catnip Trip Lucy in the Sky with Diamonds, Paula Ashworth Lewis. Gift from Mom in March 2015. Mom purchased the pattern while visiting my brother and his wife in Florida. My sister came up with this awesome name! 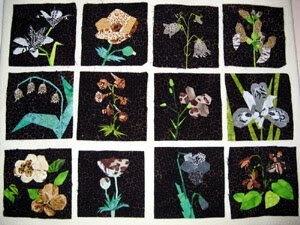 I'll be coming back to this project at the machine applique stage. The balloon is what's left to finish. #4 Konstitution. 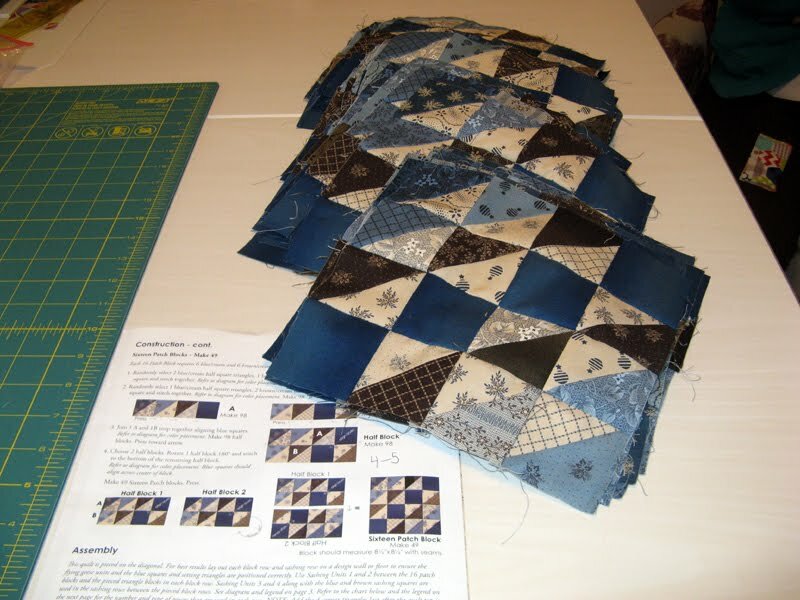 Union Blues, Etter Chelair, Quiltmania Magazine 106. Debra gave me an extra copy of the magazine she had. This pattern happened to be inside. Purchased the fat eights at 2015 San Diego Guilt Show then latter purchased the entire kit from Erica's. It was difficult to find. Kerry and I started then also languished in 2016 trying to get this one done as a BOM project. The start for this one is at Month 6. #5 Kourageous. Various designs from Linda Causee and Claudia Hasenbach. I had always thought it would be fun to assemble exotic flowers with animal skin prints. I made one flower a month as a 2011 UFO project throughout that year. This project to stayed dominant primarily because I couldn't come up with a setting that gave it the right pizzazz. It is time this year to finish it. Shelly helped me out with a setting idea so I plan to roll with it. Fortunately I saved a bunch of the background fabric. Sashing completes this project. #6 Kountry Kollection. Quilt Squares #1, #4, and #6 patterns by Lori Smith. Jo at Jo's Country Junctions ran this challenge in 2012. 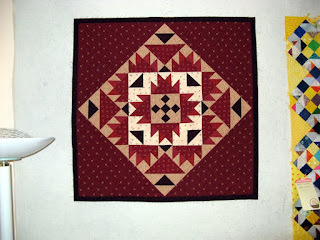 It meant making a 12" block every month throughout the year using Lori's patterns. 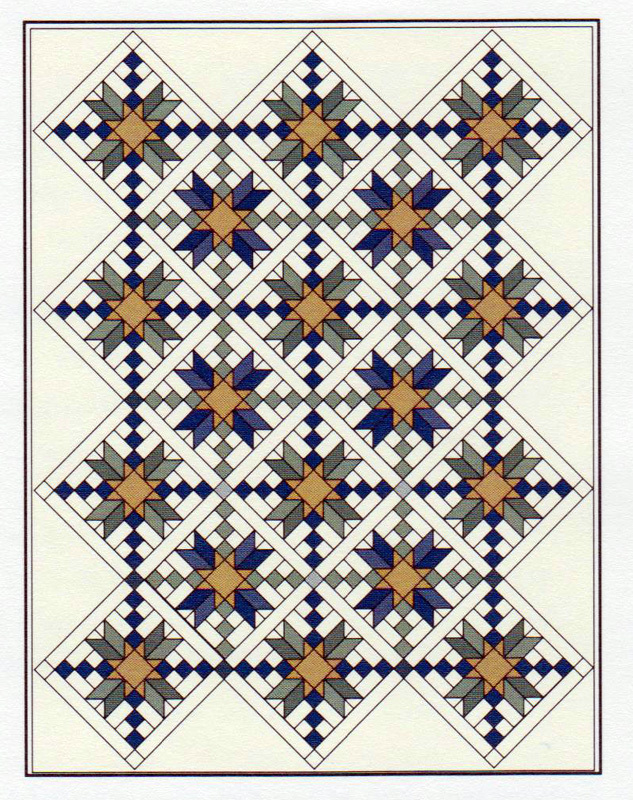 Each pattern came with several variations. The participant finished each either as an individual or a combination of some or all of the blocks. This of course means having a setting... I'll be coming up with something when the time comes. New fabrics will need to be added to do that since I didn't save anything back. Don't think this will matter at all. Sashing completes this project. #7 Kilimanjaro. Scrappy Mountains Majesty, Bonnie Hunter, Quiltville. 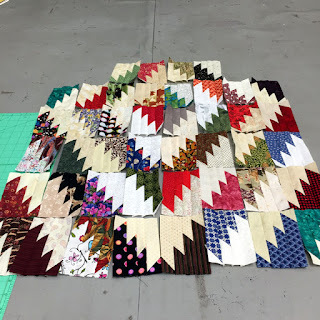 I'm using up orphan blocks on this project that was started in a workshop sponsored by El Camino Quilt Guild at Quilt-in-a-Day in February 2016. 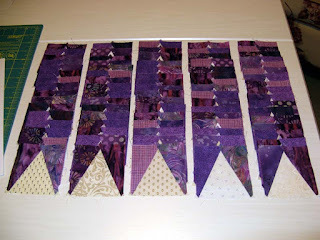 My blocks are much smaller because I started out with smaller HSTs. There are so many different arrangements but I'm pretty sure I'll be going with this one. I have quite a bit done already. The blocks go together real quick. 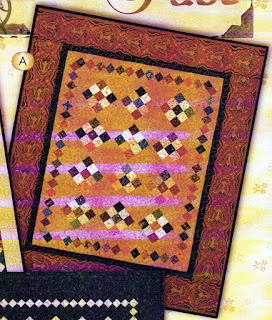 The pattern is free on Quiltville.com. More blocks to assemble...just how many...we will find out as this one builds. Susan C from a blog comment came up with the great name. #8 Kutarug. Winning Combination, Tammy Vonderschmitt, American, Patchwork & Quilting April 2016. I have way too many to count bonus triangles that will go into the making of this project. 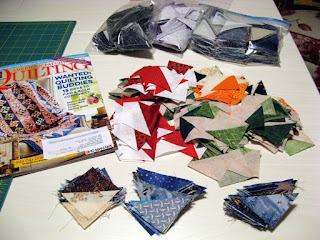 I have many of the HSTs cut to size now, but so many more to bring to design. Janet O from a blog comment came up with the great name. #9 Kakes in the Kribyard. Bricks in the Barnyard, Bonnie Hunter. 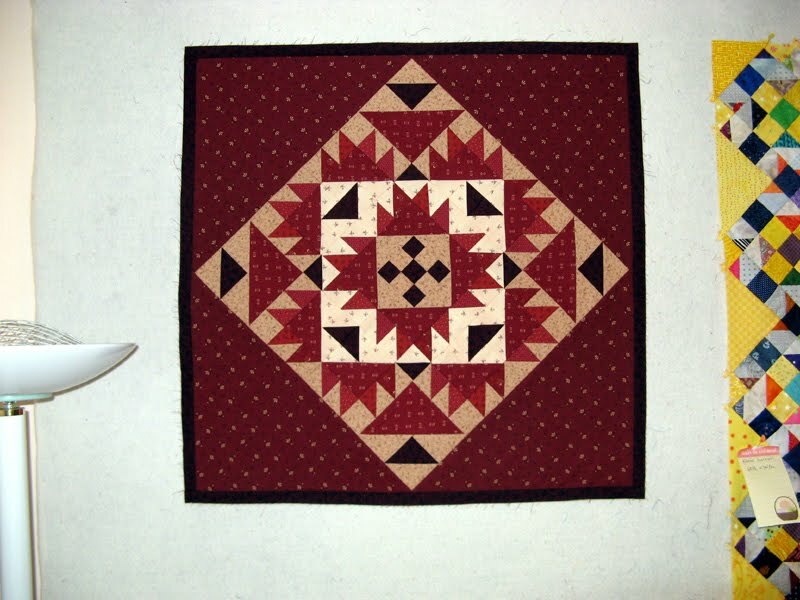 Sue decided when she was making this from bonus triangles that it wasn't quite the project for her. The pieces were more Sandi like. So she gifted me all that she'd started and the rest of the bonus triangles she had. Suppose I'll learn just how big this one can be. I'm not sure how long ago this one came to me, but at least a few years. 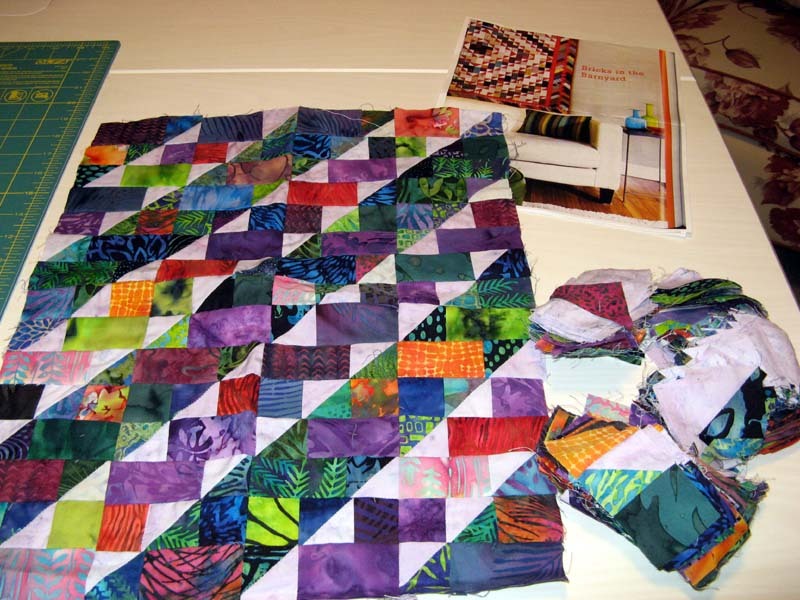 It was during a quilting retreat at the Lakeside, CA location. I'm starting this one with some blocks done and many more bonus triangles to work with. Cakes is another word for bricks and corn crib is a type of barn. Hence the name of this project. #10 Kontingency. Double Arrow, Lisa Norton and Lora Zmak, Material Girlfriends. I picked up this pattern by way of a 2015 Christmas gift from my DH. I'll be starting from scratch with this design. #11 Kissin' Korner 2. Kiss in the Corner, Bonnie Hunter, Quiltville. I made one of these last year as part of my 2016 UFOs. Silly me confused the instructions and wound up with doubling the quantity of blocks required. Well what is one to do then? Heck, let's make a second one! 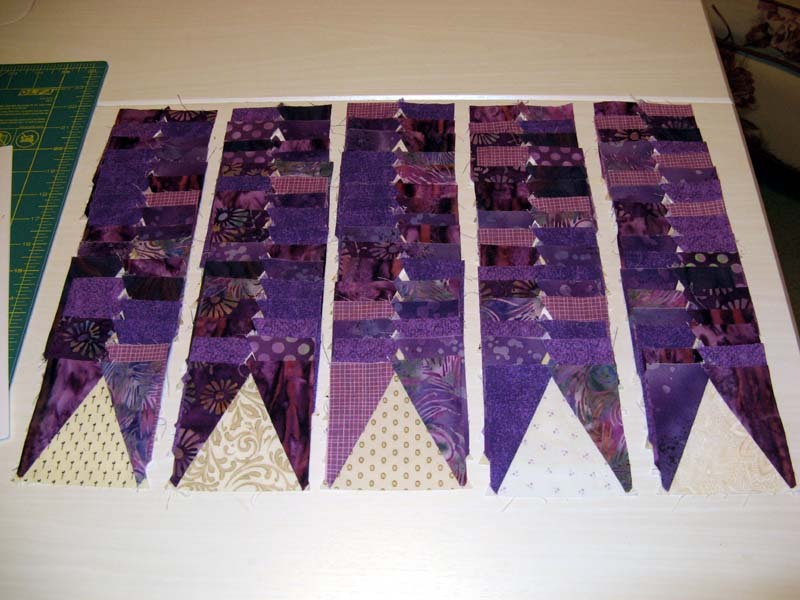 All blocks done; need sashing cut and assembled. First version is more yellow. This one will be more blue...it is all in the sashing fabric! #12 Kapture. Four Around Nine, Pam Buda, Heart Spun Quilts. These red projects by Pam are awesome. 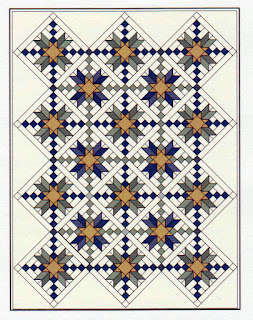 She has a series of three or four designs with each pattern. Hard to resist when you are able to see all the possibilities and the kits are right in front of you. Both pattern and fabric kit were brought home from Sunshine Quilt Guild when Pam was a guest speaker. This one starts from scratch. Great projects! Can't wait to see some finishes.